The Akhelians on their agile Fangmora Eels are a particularly unpleasant enemy for any of their rivals, because as fast as they attack they disappear again into the depths of the Ethersea. Suddenly they speed out to blind and attack the enemy armies with their biovoltaic blasts. And right behind them lurks the ghostly shadow of the Allopex. 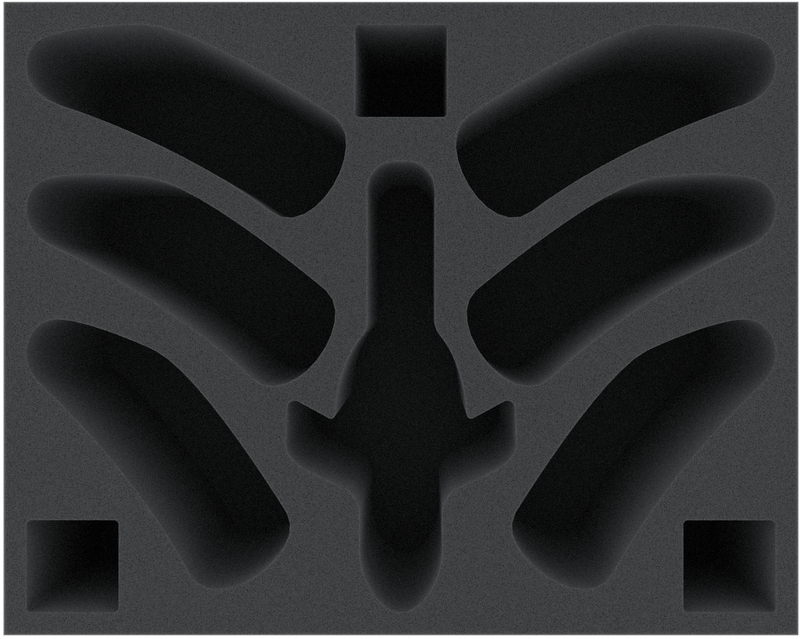 To protect your Idoneth Deepkin army from unforeseen damage, we have designed this Full-Size foam tray for the Akhelian Guard and the Akhelian Allopex. It is divided into 10 compartments of different sizes. For the models of the Akhelian Guard (both the Morrsarr and the Ishlaen fit) there are 6 miniature-precise cut compartments. In the middle of the foam mat there is a tailor-made compartment in which the Akhelian Allopex is safely stored. 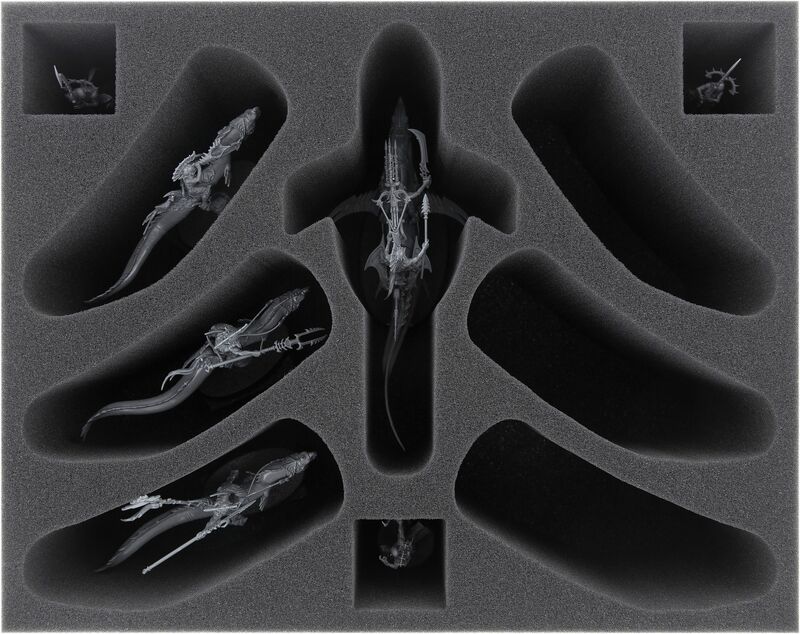 The storage of the models in precisely fitting compartments protects sensitive parts such as the volt-spears, the banner of the Idoneth Deepkin or the fins of the Allopex from damage. It also prevents the figures from slipping around and colliding with each other during transport, thus preventing the colors from flaking off or rubbing off. This would be especially annoying with these finely detailed Games Workshop models, after investing a lot of time and effort in the painting. The mat also has three square compartments for miniatures of your choice. The 3 square compartments are each 40 mm long, 40 mm wide and 110 mm deep. 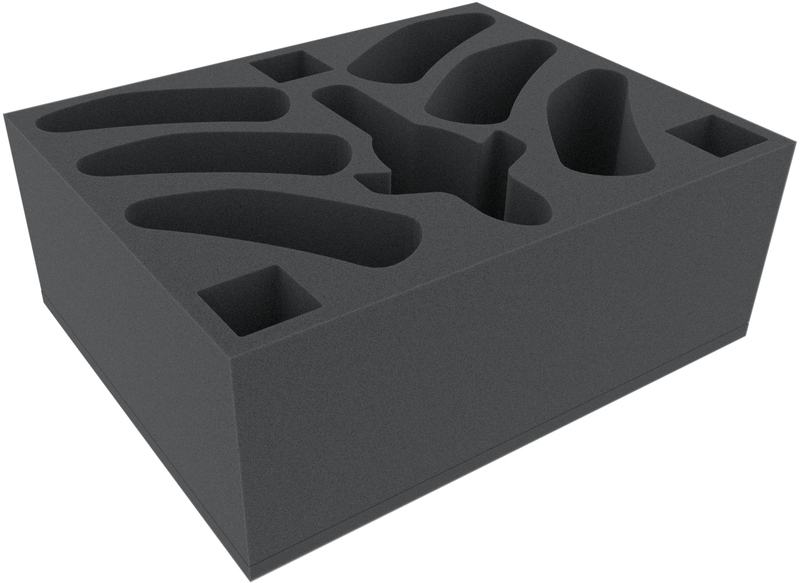 The foam tray has the dimensions: 345 mm x 275 mm x 120 mm total height (110 mm usable height + 10 mm foam base).